Memorial Day is this weekend. How did that happen? In case you’re entertaining I have a few delicious and easy-to-make grilling recipes to help you out this coming Memorial Day weekend. I love a good shrimp boil! But to be honest, I’ve never done it the traditional way… I’ve always done a grilled shrimp boil. A few years back I started making shrimp boil kebabs. They are great, but lets face it kebabs take time for skewering and take extra room on the grill. Why not dump all the shrimp boil contents on the top of the grill and let them sizzle for a few minutes. 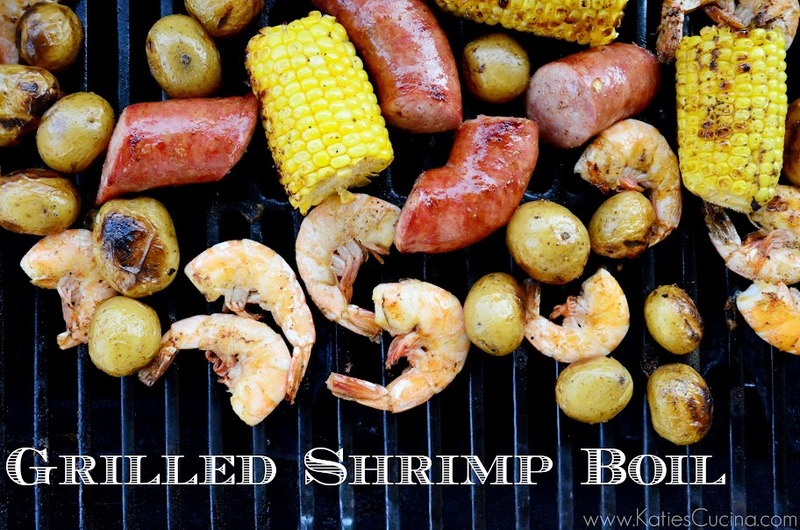 This recipe for a grilled shrimp boil is what I like to call easy entertaining. You can serve this up in large pasta bowls, on a large platter, or do what traditional shrimp boil practice is and serve it on top of the newspaper. I like minimal cleanup so when I make this recipe I like to serve everyone there portion of the grilled shrimp boil in large pasta bowls and I put a big bowl in the center of the table for shrimp peals and corn cobs! I also want to add that its rare of me to photograph food in its element. I’ve been making this recipe for years and when I started thinking about how I wanted to photograph the grilled shrimp boil I realized I should do it on top of the grill. So as our dinner cooked I began photographing making this one of few hot dinners my husband and I could enjoy! That is true food blogger style… I rush home and hurry up and cook so that way if I plan on photographing dinner that night its done as soon as possible for optimal lighting! In a large pot, add a teaspoon of old bay seasoning and boil the baby yukon potatoes on medium-high heat for 20 minutes. Stir often, and set to the side after the 20 minute mark. You don't want your potatoes to be mushy but you want them to be almost cooked through for the grill. Preheat the grill to high heat, clean, and then reduce the heat to medium-low. Clean corn and cut kielbasa and set to the side. Melt 1/2 stick of unsalted butter and combine with 3 teaspoons old bay seasoning. Place drained potatoes, kielbasa, and corn (layer in this order) in a large bowl. Pour the butter/old bay seasoning mix over the large bowl filled with potatoes, kielbasa, and corn. Mix well to ensure that the butter mixture got on everything. Place the corn, potatoes, and sausage on the grill (save the butter in the bowl). Close lid and cook for 5 minutes, flip items over and cook for an additional 5 minutes. Add the cleaned shrimp to the butter bowl and toss to coat. Add the shrimp to the grill and cook for an additional 5 minutes. Serve immediately. I’m completely craving bbq food now (totally blaming you ha) and of course we’re going to have a chillier than normal weekend – boo. What a bad weather weekend for memorial day celebrations. We do a lot of shrimp boils over the spring/summer. I love the idea of grilling everything. Oh how fun Danielle! Yes, throw it all on the grill… no-fuss entertaining! OMG!! I love this dish! And, I can’t wait to see you in a few weeks! Thanks Lauren! I know… I can’t believe BHF is right around the corner!!! Eeeep! I’ve never had a shrimp boil but I’ve been seeing it around lately so I better get on that, huh? I love that all of the food bloggers are nodding as they read about you rushing home to get the best light. See you soon, Roomie! This looks like so much fun! I love how you put everything directly on the grill. 🙂 I don’t think our weather is going to be that great either, so no grilling for me this weekend. Thanks Crystal! I hope you finally get to try this recipe! So simple and so delicious! This looks amazing!!! I want some right now! Thanks Brandy! I’m so grateful I can grill just about year round!